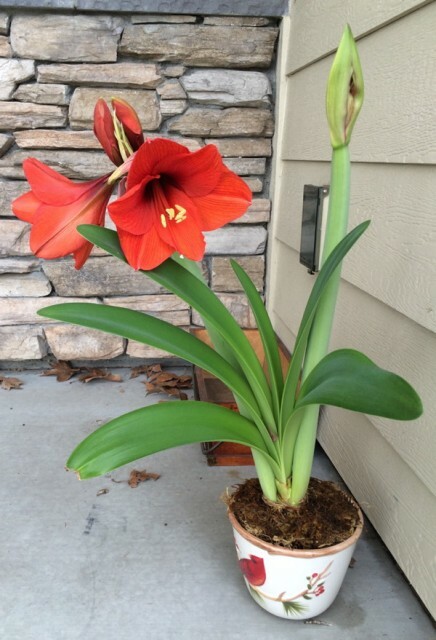 For Christmas my aunt and uncle gave me an amaryllis plant. Pretty neat, but before I set it up I had to check whether it was poisonous to cats, since both Jackson and Sadie like munching on plants (yet another obstacle to my mastery of growing orchids!). It turns out it is moderately toxic, so I decided I couldn’t just set it up in the house. So it sat for the better part of a month while I thought about it (or, really, ignored it). Around my birthday I realized that the plant was forcing the issue, as even though I hadn’t watered it it was sprouting anyway. So I unpacked it – it came in a very attractive little pot – and put it out on the front porch, where it will get a lot of indirect sunlight and hopefully not get too cold. And I started watering it. And it looks like it has more flowering yet to come. I’m not certain what I’ll do once it goes dormant for the summer, maybe put it in the garage, where it will stay warm and get some light. But it’s working out pretty well so far.